These are a small size of commercial style envelopes. They have a standard size poly window on the face. 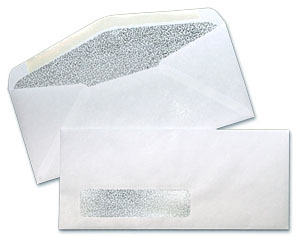 These envelopes are made with diagonal seams and have a black inside tint. They have a commercial style flap with moistenable glue seal. These envelopes provide a professional look at an economical price. The brand for this envelope is printmaster or something comparable.